Justine from bare Escentuals popped into LoveLula.com this week to give us a demo of the bare Escentuals range. There were a couple amongst us who hadn't tried the products before and by the end of the session were clamouring to make use of their staff discount and get kitted out! bare Escentuals are the masters at creating the perfect base. They were the creators of mineral makeup, the company launched 30 years ago and is still the world's no 1 mineral makeup range. 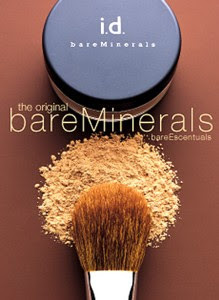 Their pure mineral makeup products are incredibly easy to apply yet give a flawless and professional finish (many makeup artists recommend their mineral foundations). The crushed minerals look like a powder but turn into a cream when applied, yet it feels like you've got nothing on your skin. It's incredibly flexible though - so you can choose a sheer light coverage look or layer up for more complete coverage. - Do use the bare Escentuals application brushes - they are specially designed to hold the right amount of product and to distrubute the foundation evenly and flawlessly onto the skin. The face brush is better for lighter coverage and the kabuki for more complete coverage. - Less is more!! Put a tiny amount of mineral powder into the lid of the foundation pot, swirl the brush around into the lid so that the minerals work their way into the hairs of the brush, tap the brush to remove and excess powder from if then buff the brush around the face to work in the foundation. Keep repeating until you get the right level of coverage. - Make sure you're applying the foundation after your moisturiser has fully absorbed so your skin is dry and matt. - To prevent the powder getting everywhere punch a couple of holes in the safety cover of the product rather than removing it. This will give you much more control. - For a dewy glow use the Radiance Multi Taskers on the parts of your face that catch the light (nose, forehead and chin). I'm loving the clear radiance at the moment.